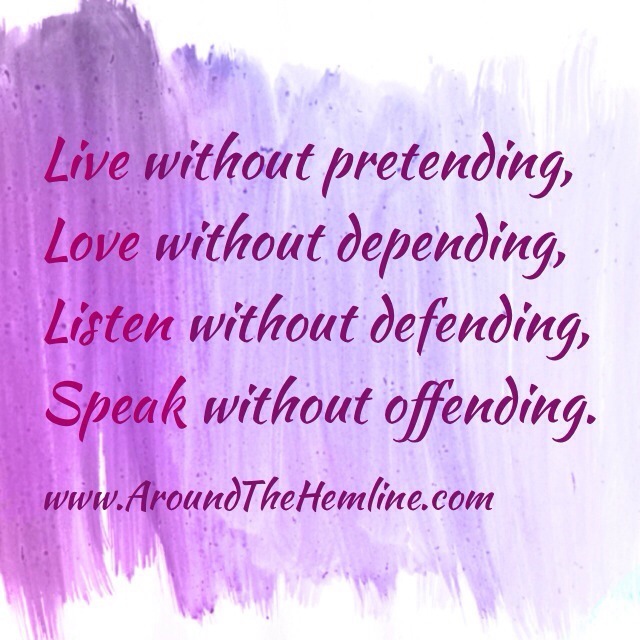 Live without pretending… Always be REAL with yourself and the situation at hand – what are the facts? Never pretend about the person you are. How are you to be a better person when your own foundation is fictitious? Never depend on others loving you if you don’t love yourself first. Love should never fill a void that you should be fill yourself as love should only be an additional piece to the amazing person you are. Listen without defending…When others speak to you about you, try not be defensive and just hear what they are saying. Their feelings do matter as well. Their feelings and concerns could be constructive criticism to making yourself a better person. Speak without offending… Control what you say and how you say it. You never know what can hurt someone and yourself. Try not to speak out of anger or irrational thoughts. Have a awesome and fabulous week!